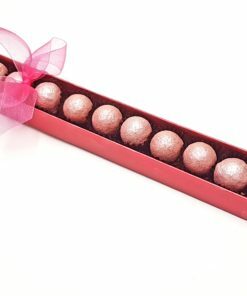 Our new luscious limited edition Pink Champagne truffles – perfect for Valentines day or Mother’s day. Soft creamy centre made with real Pink Champagne and Marc de Champagne rolled in super high 45% cocoa white chocolate. Our Jersey cream comes from the Bowles family Ivy House farm, Beckington on the Wiltshire Somerset border. 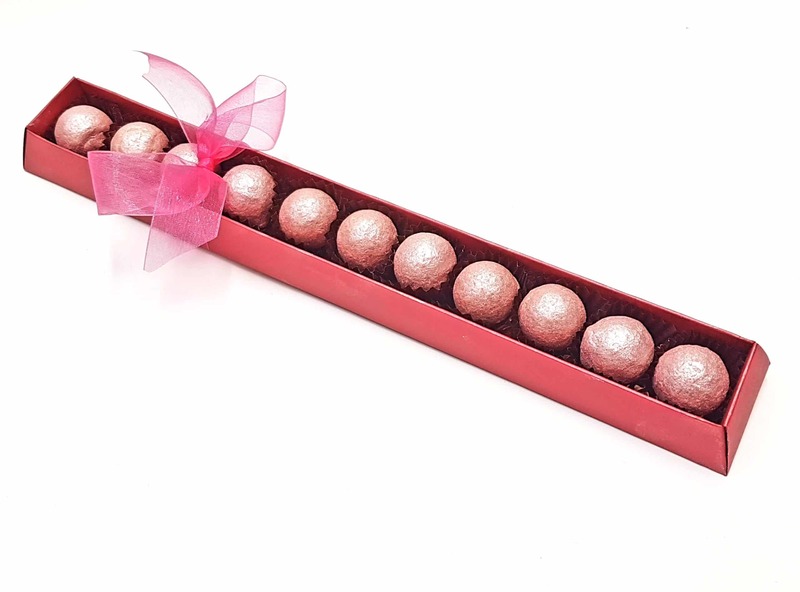 11 Pink Champagne truffles 100g. Our chocolate recipes contain only the allergens listed in bold, but as we make them in the same kitchen as products containing other allergens, we cannot guarantee that they will not contain traces. Made in a kitchen that also handles nuts, peanuts, sesame, Soya, milk & wheat. The box is card and can be recycled in cardboard recycling. The clear film wrap is home compostable, made from wood pulp, and will break down in the environment in 3 weeks.. Put it in your food waste, garden waste or compost heap. (Don’t put them in plastic recycling). Pale grey inflatable cushions are made from recycled potato peelings and are marked in green as home compostable – put in them in your food waste, garden waste or compost heap. (Don’t put them in plastic recycling). We occasionally recycle and reuse cushions that come in to us from our suppliers. These are not marked as home compostable and are usually plastic and can be put in plastic recycling or reused.